What are the Top Practice Areas for Video Telemedicine? Using video chat technology has proven to be a cost-effective way to provide non-emergency medical care. Moreover, congressional proposals to telemedicine reimbursement will take effect in January 2019, which may broaden the appeal and application of video telemedicine for providers and patients alike. Several of these laws will help clarify Medicare reimbursement to healthcare providers using telemedicine billable codes. However, many healthcare providers are unclear on what the video telemedicine practice areas are. 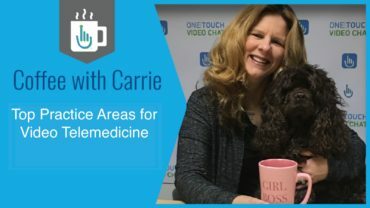 In this Coffee with Carrie, we will help elucidate the top practice areas for video telemedicine. Chronic diseases are the leading cause of death and rising health care costs in America. In addition, chronic care requires repeated follow-up appointments and communication with patients. However, telemedicine can have a huge effect on how physicians interact with patients that suffer from chronic ailments. Providers can optimize chronic care as one of the video telemedicine practice areas while cutting down hospital readmissions and unnecessary ER visits. For example, 30% of patients prefer doing their dialysis from home. Therefore, video telemedicine can be beneficial for spotting infections or flushing lines without patients having to leave their house. By engaging with remote, video chat technology, providers can expedite follow up appointments and help patients better manage their health. Although telemedicine has been adopted in various health care aspects, its development in pre and post-operative care has become one the top practice areas for video telemedicine. For instance, using video telemedicine for pre-surgical instructions the day before can help ensure patient compliance and ease provider scheduling. Providers can perform pre-operative workups and pre-habilitation before surgery. Also, Video telemedicine can be a key lifeline after surgery. Providers, for example, can engage with patients via video chat for a virtual appointment and spot complications early on. Women’s health issues during pregnancy and prenatal care are also included in the video telemedicine practice areas. Obviously, expecting mothers, especially first-time moms, require several medical appointments to ensure a safe delivery and healthy child. There are many examples of the use of video telemedicine in pregnancy, one being remote monitoring of blood glucose in diabetic pregnancies. Other applications can include genetic counseling, infertility consultation, and fetal anomaly management. A recent survey by the Nemours Children’s Health System indicated that while only 15% of the 500 parents who responded to the study have accessed pediatric telemedicine. But 64% plan to use it within a year for common childhood conditions, such as fever and respiratory conditions. Any parent can tell you that having a sick child can be a huge challenge. But a virtual pediatrician can maintain continuity of care and provide parents with the comfort of a trusted physician, anywhere, anytime. One in five American adults is diagnosed with a mental disorder. And more than half of them do not receive the treatment they need. There are multiple reasons and issues about why these people cannot receive proper care. Sometimes, patients live in rural areas where mental health specialists are a rare commodity. However, data shows that mental health treatment will become one of the top practice areas for video telemedicine. A University of Zurich study divided a group of patients in half and found that video telemedicine alleviated levels of depression by 53%. The ease and convenience of video telemedicine can lessen the burden of fighting traffic to get a doctor’s office or squeezing a patient into an already tight schedule. All patients and providers need is a computer, webcam, and internet access. Currently, we have a national crisis with the opioid epidemic, which has claimed the lives of hundreds of thousands of Americans. While the problem is complex, video telemedicine offers a unique solution to combat the opioid epidemic. One area where providers can utilize video telemedicine is with peer to peer counseling. Hospitals have already begun to hire peer specialists, former addicts with “lived experience”, to counsel overdose patients. With the help of grants, some innovative providers take this further by utilizing video telemedicine continue the addiction treatment. This technology can maintain and even strengthen the personal relationship between an addict seeking treatment and the peer specialist who wants to help them. When prioritizing the top practice areas for video telemedicine you should consider both the operational efficiencies and revenue enhancements. The video telemedicine practice areas outlined above offer the best opportunity for both. Click here to learn more.